Standard-Triumph Review - a motoring magazine from the 1960s. Homepage. This page: Standard-Triumph's in-house motoring magazine of the 1960s. A variety of in-house motoring magazines produced by car manufacturers in the 1950s and 1960s already feature in this section, and now it's the turn of Standard-Triumph's offering - the Standard-Triumph Review. Anyone who handed over 1 shilling to their local Agent could keep up with all the latest news regarding Standard and Triumph motor-cars and light commercial vehicles. I've several copies of this magazine from the early/mid 1960s, but for the purposes of this page I'll focus on one issue - Number Ten, Volume 24, 1962, with a glistening Phase 3 Vanguard on its cover. The cover features Miss Ramona Rull, a secretary within the United Nations, sat ".. prettily on the bonnet of a Vanguard during a treasure hunt sponsored by the Hong Kong Motor Sports Club". Contents of this 1962 magazine. The Standard-Triumph Review magazine is as much about lifestyle as it is motoring. Evidently they saw the Triumph man or woman as something of an outdoor activities type of person, at least that's the impression given by the first article in this issue. Looking at the fun to be had winter skiing in Scotland, the author describes the preparations that would be required before venturing near the slopes. At least there is a photo of two bobble-hatted men driving a TR3A, to maintain a link to Standard-Triumph cars, even though by 1962 the TR3A was on its way out, making way for the TR4. After a theoretical article regarding a tyre designed by Goodyear for a lunar lander designed by NASA, there follows an article by a Mr Colin Duckett, where he describes a ten-day break driving around the lanes of Eire in another TR sportscar. Surprisingly, for a magazine titled Standard-Triumph Review, there is no mention of the car anywhere in the text. The Standard "Twenty" and "Fifteen" vans. After the relative glamour of sporting TRs, the next article takes the reader through the many merits of the Standard Twenty, and Standard Fifteen panel vans (based on the previous Standard Atlas). These vehicles were Standard-Triumph's first foray into commercial vehicles of this size, with styling reminiscent of that found on vans from rivals BMC (the Austin 152 and Morris J2), and Commer, with their forward-control 1500 model. The Twenty (20cwt) was rated at one ton, and was available as either a van, pickup or chassis cab, with forward motion provided by either petrol (2,138cc) or diesel (2,260cc) engine. The Fifteen (or 15cwt) van had a 1,670cc petrol engine, as found in the earlier Atlas Major, pumping out just 57.5bhp to propel it, which while it doesn't sound particularly punchy, must have been an improvement over the under-powered 948cc Atlas vans they replaced. Triumph Herald pickup & related matters. 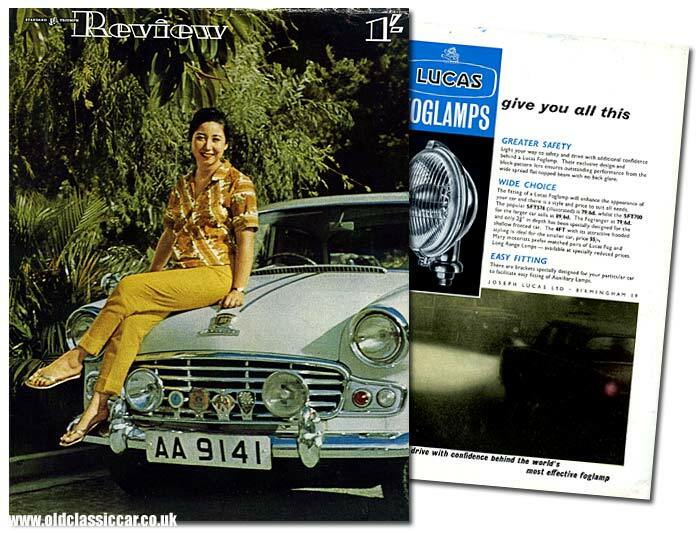 While on the subject of light commercials, the centre pages feature snippets about various Standard and Triumphs around the globe, including a small photograph of a one-off Herald pickup built by ZF Garages Ltd of Hong Kong. Using the remains of a crashed example, the garage built the pickup to use in the course of their business. Signwriting on the Herald's door suggests that ZF Garages were dealers not only in Standard-Triumph motor-cars, but also Mercedes-Benz and DKW Auto Union. It certainly looks like quite a snazzy vehicle! A different example, owned by a chap who ran a translation company, is also shown. Heralds were, and still are, one of the easiest cars to maintain from that era, and the article on page 386 of Standard-Triumph Review was written with DIY spanner jockeys in mind. It looks at the 12,000 mile service, and guides the reader through the various checks, adjustments and fluid replacements that would be required. Herald owners would no doubt also be fascinated by a letter sent in by a Mr Birkett, of Crag Hill Avenue in Leeds, where he describes how he built a roof rack for his Herald 1200 out of mahogany no less. A roof box, constructed again Mr Birkett, allowed him to transport bags, cases and the like on his new rack while keeping the contents dry, and hidden from prying eyes. Happily, even with the roof rack fully loaded, the Herald still handled perfectly (and quite possibly better than when unladen!). Another letter writer gushes with praise over the handling of his 1200 Herald. While travelling along the A31, at something over 60 mph, a cyclist had decided to swerve into the path of a Mr Cooke while he was at the wheel. He took "violent, evasive action" to avoid the moronic cyclist, during which time "... the car handled perfectly and showed no inclination to roll and when I had to slide it sideways on to the verge, to miss other traffic, it went on to its side and slid about 30 feet before coming to a halt and falling back on its wheels. The body damage was negligible, under the circumstances, and the offside stub axle and half shaft were bent when hitting the verge which is hardly surprising." W.A.C. Pettit, Standard-Triumph dealer in Virginia. A one-page article in Standard Triumph Review describes the car collection belonging to W.A.C. Pettit, a S-T sales agent based in Louisa, Virginia, since 1958. His day-to-day transport at the time was a TR4, fitted with spoked wheels and whitewall tyres. He bought his first "old" car in 1943, a 1910 Stanley Steamer. By 1962 it had been joined by a further 74 collectable cars, half of which were displayed at Pettit's Antique Shop and Museum of Motoring Memories. Star vehicles included a 1906 Reo Runabout, V16 Cadillac, and a 1947 Tucker, although absolute pride of place went to a stunning supercharged Duesenberg, first purchased by German artist Rudolph Bauer. Coachwork, to Bauer's design, was commissioned in 1939, with the work undertaken by Rollson of New York City. The finished car, powered by a straight-eight engine of 6.8 litres (420 cu in) was finally delivered in April of 1940. The Duesenberg was fitted with a "muffler bypass" system, and apparently "... its shattering noise is very effective for clearing the roadway. Claimed performance is 104 mph in second gear, and 129 mph in top with adequate acceleration." The Duesenberg SJ chassis cost $11,750, with an extra $9,043.41 being charged by Rollson for the bodywork, bringing the total to an eye-watering $20,793.41. Happily the Duesy is still very much in existence, and sold for over $2.8M at an auction in 2007. It is reported to be in very original, preserved rather than restored, condition. The Standard Car Register, and a 1919 SLS tourer. In the early 1960s, Standard-Triumph ran the Standard Car Register, with an address on Fletchamstead Highway in Coventry. Page 394 of this issue deals with matters Standard-related, including this interesting account of tracking down a 1919 Standard SLS, rumoured to survive in Worcestershire. "About eighteen months ago, the Registrar heard rumours of an early Standard in Worcestershire. Plans were laid to investigate the problem and the search began on a rainy evening in Stourbridge. The trail was followed to Bromsgrove but the "bird had flown" and Halesowen was the next port of call. Here the car was discovered in the hands of Mr E.C. Emery, the local Rootes dealer who was, surprisingly, undismayed to find two dripping enthusiasts on his doorstep at 10.30pm! He thoughtfully insisted on a drop of "hard" liquid refreshment before donning his raincoat to guide us to his garage. Paddling across the tennis court by torchlight he unlocked the doors to disclose two vintage cars, an early Humber fixed-head Coupe and a 1919 9.5hp "SLS" model two-seater Standard, one of only three known to remain in existence. The journey had not been in vain. Mr Emery was undecided about the Standard and could not then determine whether to put it into running order or part with it. Eventually the latter course of action was chosen and, following an advertisement in "Motor Sport", it left Halesowen. The old Standard, registration NH 2685, was bought, as an unusual engagement present, by the then fiancee of Mr G.P.A. Dutch who lived in Beckenham, Kent. The decision was taken on the spur of the moment and it was decided to tow the car down the M1 secured to the towing vehicle by a length of old clothes line [!]. Needless to say, this was not a very satisfactory method of towing a car one hundred and fifty miles, but despite the fact that the rope parted on three occasions, and some moments of anguish in the London traffic, the car reached Beckenham just before dark. Since then Mr Dutch has moved to Lamberhurst, Kent, and although he has not had much time for restoration work, a start has been made and he hopes to have the car in service for the 1963 season." Did Mr Dutch ever get this Standard SLS tourer onto the road again? It doesn't show on a current check of the online DVLA database, but surely it wasn't scrapped or broken for parts? Other copies of the Standard-Triumph Review will feature here in future. The copies I have in my collection feature the following cars on their covers - Triumph Spitfire 4 Mk2, a brace of Triumph 2000s, and a pair of early Heralds. All these magazines came in a collection I bought some time ago, one of which features a stamp to its cover for College Motors Limited (Standard - Triumph Distributors), 65 Whiteladies Road, Bristol. By the end of the 1960s, factory-produced articles about Triumph could only be found in BLMC's new title, High Road. Return to the car magazines section for information on similar titles. Elsewhere on OCC, a former employee of Standard-Triumph recalls his time spent working at the factory, the people he worked alongside, and various pranks that took place. Read this two-pager article here.